Move in ready! Open floor plan and good size rooms. Lam floors in living room and hallway. All kitchen appliances stay. Deck overlooks common area, nicely landscaped with plenty of trees and shrubs. Clubhouse with indoor pool, exercise room, ping pong and pool table. Tennis court. Laundry in each building. Newer vinyl windows. Detached garage! 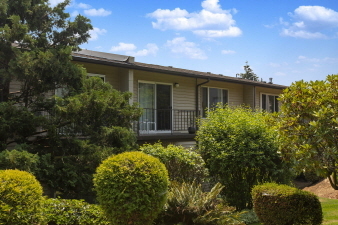 Nearby downtown Gresham, public transportation and shopping. Interior Features Laminate floors; wall to wall carpet; open floor plan; kitchen appliances. Exterior Features Vinyl windows; private deck; indoor pool; rec room; tennis court. Additional Features and Amenities Detached garage!